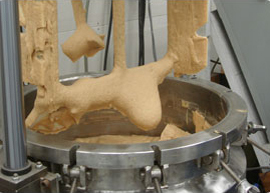 Commonly, the entire cream, ointment or lotion manufacturing process - heat, mix, disperse, emulsify and cool - is done in expensive jacketed kettles with anchor-style agitators and dispersion heads, or in more costly kettles with counter-rotating agitation plus recirculation through a colloid mill. Subsequent batches cannot be started until the first is completely finished and this may take as long as 4-6 hours. A production increase can be obtained by splitting this process into two phases: a base preparation and a finishing state. 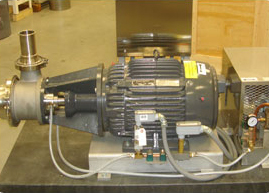 A relatively inexpensive reversible homogenizer is suspended in a cylindrical tank. 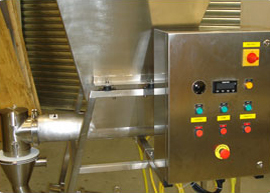 This mixer can be operated in the downward mode to quickly draw fine solids into the fluid, or reversed to the up-mode mode for emulsification. 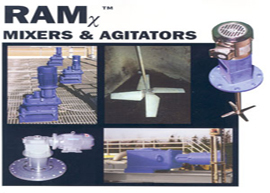 In both operating modes, a multi-bladed 24 degree rotor rapidly pumps the mix through a patented twin-stator mixing head. 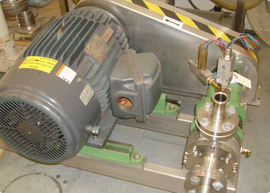 The entire contents of the tank are repeatedly subject to both hydraulic and mechanical shear. The result is a shorter period of time; 4 hours for a 200 gallon batch was reduced to 2 hours. 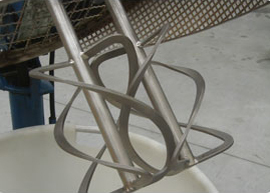 Even though the time is cut in half, enough base is prepared for several finishing stages. 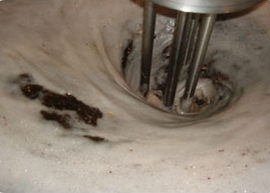 The appropriate portion of the "base" is introduced into the existing agitated kettle for the finishing stage where the additional specific ingredients, i.e., perfumes or active components, etc., are added. 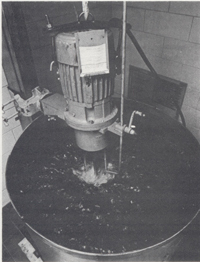 After completion of the finishing stage, the kettle is emptied and the second base portion is introduced. The manufacturing cycle is repeated as required. The cost of a reversible homogenizer and its cylindrical tank is considerably below that of a similar sized jacketed agitated kettle. The unique manufacturing technique provides a major savings in capital expenditure while greatly increasing cream, ointment and lotion production in the pharmaceutical, cosmetic and toiletry industries.